(also during the winter time and snow). The Segway Riga City tour takes about 1.5 hours. First time users will get the instruction on how to operate a Segway. The price is 30 lats. 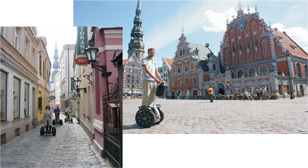 The Extended Segway Riga City tour takes about 2.5 hours. First time users will get the instruction on how to operate a Segway. The price is 45 lats. 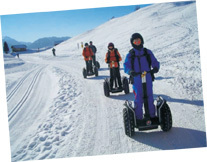 The Group size is limited to 12 persons including Segway Tour guide. With larger Groups up to 20 persons we would ask you to give us a notice two weeks in advance. Feel like doing something totally different? Something a bit Extreme? Then we have the tour 4 You! You will go thru Mud and Water, Forest and Rocky Terrain. You Got to be Fit- here you will go to your Limit's and overcome them. Fun Factor 100% Total time min. 2 Hours Costs: 100 lats per Person min of 3-5 people. Please Contact us for Group arrangements of 5 or more. We offer Tours around the Sigulda City for groups up to 10 persons including Segway Tour guide. We offer Tours around the Jurmala City for groups up to 10 persons including Segway Tour guide. Including Safety training (20 Minutes) Netto inkl. a day’s rent will have to be charged. ca. 2 hours includes Safety training. at least 2 hours, includes Safety training. Off Road at the Sigulda or Gauja or your choice. A copy of your Credit Card and passport will be needed when renting a Segway.